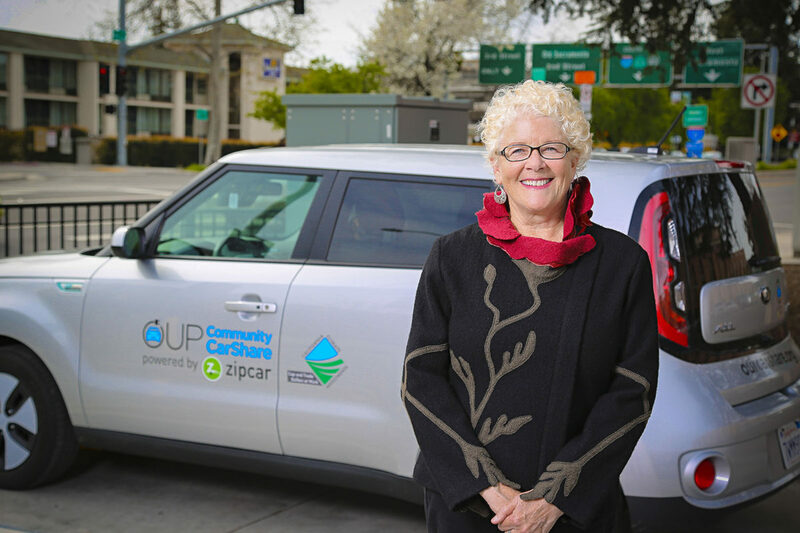 Susan Brown now has clean, affordable, reliable transportation thanks to electric vehicle carsharing. The sharing arrangement went sideways, though, when her neighbor took over the car and elbowed Brown out. She tried public transportation for shopping and trips to her doctor, but it didn’t work for her. “Because of my PTSD [Post Traumatic Stress Disorder], I would get confused and lost,” she recalled. “I spent seven hours one day trying to go to the doctor.” She used a monthly bus service to Walmart for seniors, but her diet suffered, and so did her health. Then in May 2017, salvation came when she went to a presentation on a new carsharing program for residents of Edgewater and two other affordable and senior housing communities in Sacramento, Alder Grove and Lemon Hill. Called Our Community CarShare, the program is a pilot designed to help people like Brown get around town—but with non-polluting electric vehicles. it was made possible by legislation called the Charge Ahead Initiative, also known as SB 1275, authored by Senate President pro Tem Kevin de León, which required the California Air Resources Board to create programs that would increase access to electric vehicles for individuals impacted most by poverty and pollution. The $1.3 million initial funding for the pilot comes from the state’s Greenhouse Gas Reduction Fund, created with monies derived from the cap-and-trade program to reduce fossil fuel pollution. And for eligible low-income residents, the pilot program has another benefit: free membership. Our Community CarShare sprang from a collaboration among key agencies with the dual goals of aiding low-income residents and reducing air pollution. The Sacramento Metropolitan Air Quality Management District submitted a funding proposal to the California Air Resources Board for a year-long pilot, in collaboration with the city, the Sacramento Municipal Utility District (SMUD), the Sacramento Housing Redevelopment Authority, Mutual Housing and Policy in Motion. Zipcar, one of the first carsharing companies, provides the vehicles—electric Kia Souls—and manages the program. One of the electric Kia Souls used by members of Our Community CarShare in Sacramento. After considering a citywide electric carsharing program, the partners soon realized that was too ambitious and narrowed their focus to the three affordable housing communities. There are a total of eight cars, with charging stations and two cars based at each community and at the Sacramento train station. In early March, a fourth community, Riverview, joined the carsharing pilot. Its residents use the cars at the nearby train station. CarShare members must reserve a car through a phone app or online at the program’s website. Cars are not available between 12 a.m. and 4 a.m. to ensure that they are fully charged. There is a three-hour maximum use and cars must be plugged in to charging stations when returned so they are ready for the next member. Advocates for underserved communities see Our Community CarShare as exactly the kind of investment in disadvantaged communities that California should make with funds paid by polluters. A series of forward-looking laws guarantee that at least 35 percent of the Greenhouse Gas Reduction Fund must go to help reduce pollution and create services and jobs in disadvantaged communities and benefitting low-income Californians. Magavern said recent air monitoring data from the Sacramento Air Quality Management District found that toxins from fossil fuels were higher in environmental justice communities—typically low-income communities of color—than in higher-income areas. That pollution, which puts residents at greater risk for a variety of health problems, stems directly from land-use decisions that sited heavy traffic routes closer to communities of color. “So it’s appropriate that we’re channeling these services to communities that suffer from bad decision-making,” Magavern said. 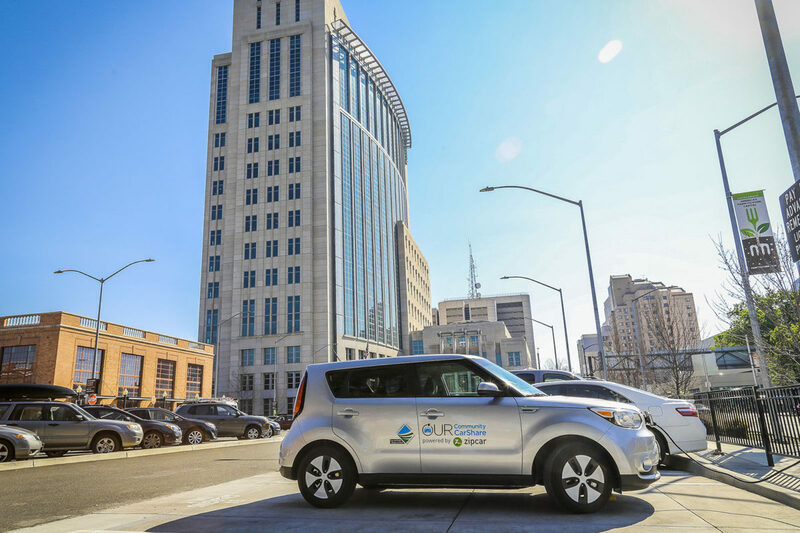 The Greenhouse Gas Reduction Fund has up to $22 million for carsharing pilots for the current fiscal year, according to Magavern, which includes $5 million to expand the Sacramento pilot and another one in Los Angeles. As the carsharing pilot approaches its one-year mark, Charkiewicz said the partners are upbeat about the program’s success, and plan to add six more cars and two more housing communities during the second phase. They’ve also learned from some of the unanticipated challenges in getting it off the ground. Free memberships were available to the first 300 people who signed up, but only 149 residents have joined as of March 2018. All that’s required are a valid driver’s license and clean driving record, but many potential participants need lots of convincing, she said. The CarShare creators are acutely aware that members like Tolliver and Susan Brown have come to depend on the program, especially because it is free. Happily, it appears that funding will continue through the next year at least and this will remain a priority program for California in the coming years. Clean carsharing represents a growing wave in clean, affordable transportation in California.